Around a quarter of births in the UK are via cesarean section. The discussion around cesarean birth can often be framed negatively but in many cases a cesarean birth can not only be necessary it can be life saving, and it can be a very positive experience for the people involved. 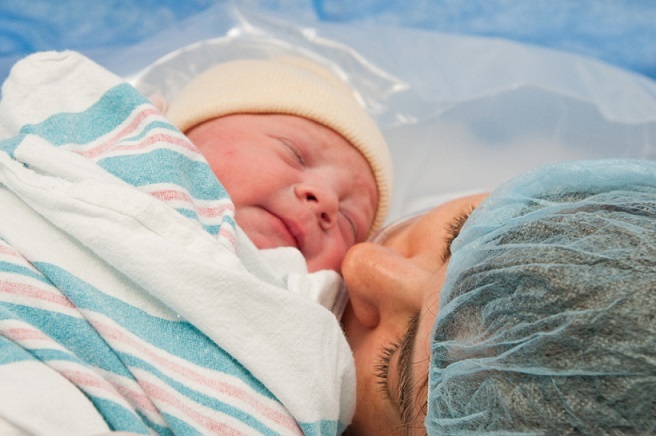 We wanted to share some stories and reasons people found their cesarean births positive. Neither me or Jenni have had a cesarean section so we have reached out to our community to talk to people who have experienced positive care. Ruth had planned a vaginal birth for her twins but opted for an elective section late in pregnancy. Laura has had two cesarean births, one a planned elective section and one an emergency but views both as very positive experiences. “My second baby was a planned c section. To be honest, I was a mess emotionally after a traumatic birth and first month with my first. The section allowed me to feel that we were limiting the risks of a repeat of the first experience. I know lots of people recommend hypnobirthing etc to get that natural non traumatic delivery. I didn’t feel I was in a place to take that chance. Non of the things I was worried about happened with the planned section. We came home 2 days later. It was a wonderful happy experience that helped heal old emotional wounds. Helen had an elective ‘gentle’ section. Not all hospitals are happy to facilitate this but it is becoming more normal. What Makes These Births Positive? In all of our stories, the key to these births being seen as positive was the care received. These women felt supported, listened to and well informed about the choices they were making. They felt that they were being given options and could choose the right birth for them on the day. Whilst a cesarean birth is major surgery and can be traumatic experience, it is not automatically traumatic if everyone is supported throughout. Thank you for this article. I agree, so much we read about c section is negative and/ or scary. I have had two and no complaints with either. First time was an emergency at 42 weeks after 28 hours of contractions and attempts to induce. Going into theatre was a bit scary but I felt so relieved after the endless pain and lack of progress. Up on my feet in a couple of hours, home after two days and pushing the pram into to town. A bit uncomfortable but basically felt normal once the stitches were out on day 5. Second time was elective as I could not face the same scenario again. Really helped to plan for my then two and a half year old who’d never slept without me. It was calm and from my perspective straight forward. I saw my son come out in the and he was on my chest skin to skin asap. I felt a little more sore this time but not painful. I was given codeine and paracetamol and never really felt I needed it. I know I shouldn’t have but I could still carefully put my eldest in and out of the bath within a week- not saying you should, just that I was lucky and felt ok to do it. So, I know I was one of the lucky ones with my recovery, but lots do find it a positive experience, just as natural birth can be different for different people, so can c section. Thanks for sharing your experiences Elena, I am glad yours were positive!